Spas are the Maremma’s single biggest claim to fame. 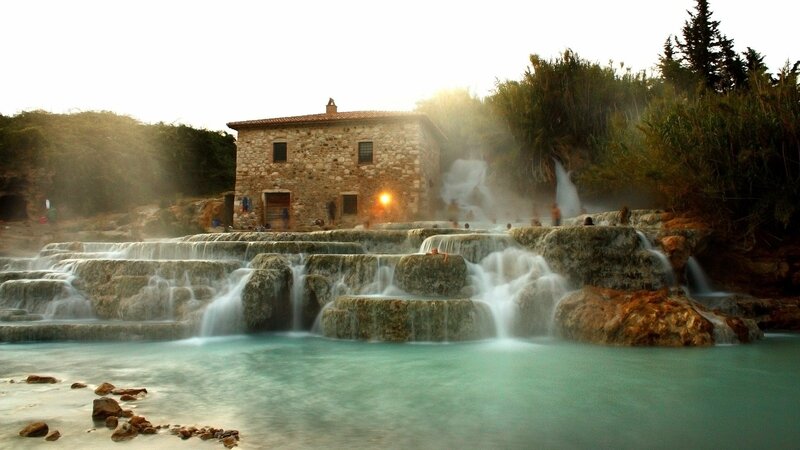 The hot springs in Saturnia draw more tourists than most of the region’s other cities put together. People have been flocking here since before the Roman Empire. 1. The first is the most budget-friendly. It’s a dip in the Cascate del Mulino – the spectacular waterfalls that sit invitingly just outside of Saturnia. Completely free, these waterfalls fill natural pools with the 37°C water all year round. The view of the Maremman countryside from here is breathtaking and the pools are full of locals and tourists even in the coldest moments of winter. 2. If you feel like pampering yourself, you can upgrade your Maremman spa experience by treating yourself to a day in the Terme di Saturnia Spa Complex. Choose to unwind in the marble pools and luxurious patio or go all out and indulge in a massage or spa treatment. A day in the pools costs around €22, spa treatments are extra. To reach Saturnia’s Hot Springs, follow the Strada Provinciale Follonata/SP10 until you see a small sign. A regular bus service runs to the Terme di Saturnia and Cascate del Mulino every day, but Sunday. To plan your trip, check out the RAMA website. Linea 1 from Grosseto and Linea 3 from Semproniano/Manciano are the main lines that travel to Saturnia Terme. 3. Finally, for the ultimate spa experience, you can’t go past a dedicated spa vacation. The Maremma has plenty of amazing hotels and agriturismi that double as beautiful spa centres where everything from massages and aromatherapy to jacuzzi dips and Turkish baths are included in the price of your stay. Terme di Sorano: The less famous, but no less magnificent, neighbour to the Terme di Saturnia is a local affair. The massive thermal pool has the atmosphere of a lush resort. There’s a special section for children and two man-made waterfalls. There’s also a gorgeous little water course that breaks from the main pools and allows you some measure of privacy in the oak-filled woods nearby. Antico Casale di Scansano: Winner of a Tripadvisor Hotel of the Year award for 2012, this is one of the Maremma’s best value accommodations. They have a sauna, a Turkish bath, two jacuzzis, a sun room, a watercourse that leads into a salt cave, which is supposed to have curative respiratory properties, and a huge heated spa filled with saltwater from the Dead Sea. La Ceretta: This spa is magnificent and eco-friendly. The water here is far hotter than anything you’ll find at Saturnia, bubbling at up to 40°C as it leaves its underground source. The spa itself is built from local travertine stones and has an indoor and outdoor section.